Follow Me on Twitter for my #Blissdom Updates! She makes my life easier. Easy is good. I always lay out Max's clothes for school the night before. This serves to make mornings easier and to give Max a visual clue on what is expected of him. You can read about making mornings easy with your kids here. So in order to make my life easier. I have started to pick out all his clothes for the week. This causes me to do two things every weekend 1) Laundry 2) Check out the Weather Channel. I love this system from Living Lucurto and so far it has been working for 2 weeks now. 1. Go to Living Lucurto and Print these cards. 2. Print them on heavy stock. I used two pieces, spray glued together and cut them out. 3. Pick out outfits and hang in closet. 4. Easier mornings for you. Priceless! What a cool site! Thanks for the link. 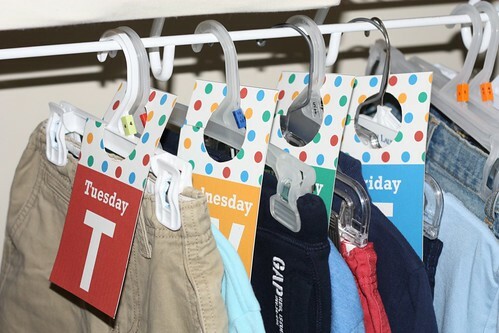 I love how organized you are, but am surprised that your son still lets you pick out his weekly wardrobe. My son stopped letting me pick out what he was to wear around 5 and yes, there were some strange outfits at times. I decided it wasn't that important and gave up the fight. INCREDIBLE idea! I love LL's blog--- jammed full of wonderfulness! 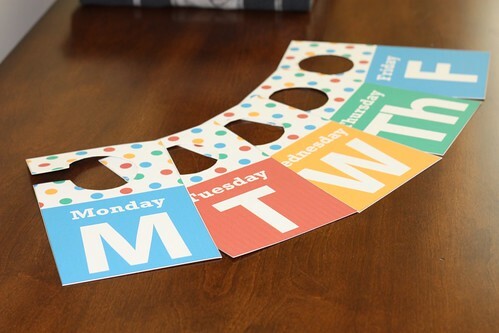 In my wildest dreams I am not this organized, but I would love to be! This is FANTASTIC! Love this system and those cards are just too cute! This must make your mornings go so smoothly! Thanks so much for sharing!